This flexible, miniaturized robot can make use of tools just 2 millimeters in size, making ever tinier surgeries possible, like taking care of cataracts. The future of surgical procedures could be changed forever with a new tiny robot that uses tools less than 2mm in size to perform intricate operation. The device has been developed by Cambridge Consultants and uses 'Axsis technology', which could be extremely useful for cataract surgery. 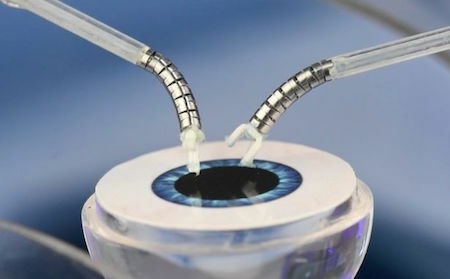 This is one of the first robots of its kind that uses flexible tools, instead of long straight instruments that are designed to pierce through the patient's skin. Not surprisingly (at least to science fiction fans), sf authors spared no effort of imagination to bring these ideas into the main stream early - even in the Thirties. Read about the ultraminiature waldo from Time Enough For Love by Robert Heinlein. Remarkably, Raymond Z. Gallun writes about microsurgery tools in 1939, in his story Masson's Secret, describing them as "surgical tools - blades, tweezers, probes - so fine you could just see them with the naked eye."